A flower farm specializing in fresh cut and dried varieties. Garlic is also available in August. Come see us at the Newmarket Farmers Market every Saturday from Mother’s Day weekend to Thanksgiving weekend. Additional products include garlic jellies, garlic spread, garlic scapes, garlic braids and green garlic. 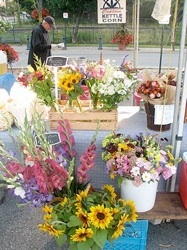 Our fresh cut flowers grown in the fields outside of Stouffville. Flower varieties include peonies, gladiolas, mixed bouquets and sunflowers. Dried bouquets are also available towards the end of the season. Potted herbs and perennials fill the tables in the spring. And last but not least — Kettle Corn. For more information please call 905 726 3356. You can also visit the website for the Newmarket farmers market for additional information.